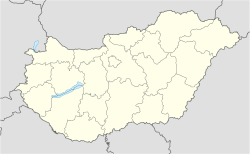 Hajdúhadház is a town in Hajdú-Bihar county, in the Northern Great Plain region of eastern Hungary. It covers an area of 87.81 km2 (34 sq mi) and has a population of 12,724 people (2015). Wikimedia Commons has media related to Hajdúhadház. This Hajdú-Bihar location article is a stub. You can help Wikipedia by expanding it. This page was last edited on 24 November 2018, at 03:18 (UTC).